Although Lombardi is considered a jobber, he won various titles in his career, and he was one of the first wrestlers to use the Superplex as his final movement; other wrestlers to use this move were Dynamite Kid and Bob Orton, Jr. The gimmick of Lombardi was that of a street fighter. In total he won 10 championships during his career despite being mainly used as enhancement talent. Lombardi began his WWF career in late 1983, competing under his real name, and being a Heel, primarily as an enhancement talent. During this period, Lombardi occasionally teamed with fellow preliminary wrestler, Barry Horowitz. Lombardi had a few victories during the 1980s, mainly, against other preliminary wrestlers like Paul Roma, and Barry O, until early 1989, when he was repackaged as The Brooklyn Brawler. The Brawler character was that of a street fighter, wearing battered jeans and a torn New York Yankees t-shirt. Under the tutelage of Bobby "The Brain" Heenan, the Brawler entered a feud with The Red Rooster. When The Red Rooster left Heenan's villain group and became a fan favorite, Heenan stated that he had made The Red Rooster a star and could do the same with anyone in the WWF. The Red Rooster defeated The Brooklyn Brawler on Saturday Night's Main Event, and then Heenan at WrestleMania V. The Brooklyn Brawler's alliance with Heenan was then phased out. Lombardi soon returned to his former enhancement talent status. However, he retained the Brawler gimmick, a role he would utilize throughout his career. Lombardi was used in a number of gimmicks, often under a mask. In late 1993 early 1994, he briefly replaced Matt Borne as Doink the Clown until Ray Apollo was hired. He also regularly portrayed Kim Chee (Kamala's handler) during his 1986-87 and 1992 stints with the WWF and briefly in 1993 as a singles wrestler after Kamala left him for the newly ordained Reverend Slick. He still regularly used the Brooklyn Brawler gimmick during this period. 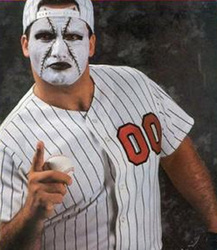 He also played MVP (Most Valuable Player) (a short-lived baseball player gimmick), sometimes also referred to as Abe "Knuckleball" Schwartz, in 1993 between his stints as Kim Chee and Doink. The only televised match he wrestled as MVP was a Battle Royal in which the last two wrestlers in the ring would go on to compete for the WWF Intercontinental Championship, but he was eliminated half-way through the match. He would use the baseball player gimmick again, but this time as a heel, as Abe "Knuckleball" Schwartz a year later during the 1994 Major League Baseball strike. As MVP and Abe "Knuckleball" Schwartz, Lombardi's face was painted to look like a baseball and he wore a jersey with the number 00. In addition, he was accompanied to the ring by a carnival-like version of "Take Me Out to the Ball Game." Since the late 1990s, he has been semi-retired from the ring, working mostly as a road agent for WWF and only occasionally appearing in the ring, usually for comic skits and matches. The Brooklyn Brawler was defeated by Dwayne Johnson, who would later become The Rock, in Johnson's WWF tryout match on March 10, 1996. Johnson later recalled the match in his autobiography; praising Lombardi as a stand-up wrestler. He then faced Rico and picked up the win. The Brooklyn Brawler lost to The Rock on the February 28, 2000 taping of Raw Is War. Lombardi had some big wins and title shots. In 1991 the Brooklyn Brawler entered into a small feud with new WWF star Big Bully Busick after the Brawler challenged Busick to match to see who the real bully of the WWF was. The Brawler defeated the Bully by countout and in a rematch one week later saw the Brawler dominate the Bully until the latter's manager Harvey Wippleman grabbed the Brawler's leg, leading to a controversial win for the Bully. On October 4, 1993 Lombardi also competed in the WWF Intercontinental title Battle Royal (as The M.V.P.). On January 22, 1994, the Brawler defeated Jim Powers in a match prior to the Royal Rumble pay-per-view. In 1997, he won a battle royal for a WWF Championship match in Madison Square Garden; he went on to face then-WWF champion Shawn Michaels, in a match where the Brawler dominated Michaels, but was defeated due to an interference of D-Generation X. On the September 20, 1999 episode of Raw is War, Lombardi was one of the replacement referees while the original referees were on story line strike. In 2000, he scored a pinfall against Triple H in a handicap match and singles victory over Just Joe on an episode of WWE Jakked. He would then face Just Joe again and pick up the victory. 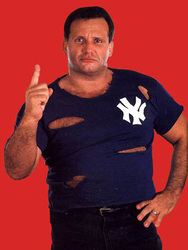 As part of an angle on SmackDown!, he adopted the moniker of the "Boston Brawler", shedding his customary New York Yankees apparel in favor of Boston Red Sox clothing. This was done in response to the Red Sox' defeat of the Yankees in the 2004 American League Championship Series, which propelled the Sox to their World Series victory over the St. Louis Cardinals, the first time they had won the Series since 1918. Lombardi did this in a segment on SmackDown! (in New York City) with Heidenreich. Heidenreich was looking to make more friends, but Lombardi decided he'd rather be the Boston Brawler. Heidenreich stopped wanting to be Lombardi's friend, which aided Heidenreich's ongoing face turn. 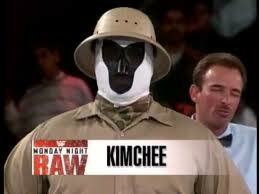 He once again appeared as Kamala’s handler Kim Chee at WrestleMania X-Seven and competed in the gimmick battle royal. In early 2006, he still worked behind the scenes of WWE, including behind the camera with John Cena on his WWE.com show "5 Questions". Cena often makes references to Lombardi, even jokingly calling him the greatest technical wrestler of all time. Also, his face popped up in front of Cena's mouth to censor curse words, usually saying "Nu-Uh!" or "Brawler!". On the June 2, 2006 episode of Five Questions, Brawler showed his face. He even censored himself, saying "YOU are a piece of Brawler". In another episode of "5 Questions," Cena acknowledged that Lombardi was actually born in Detroit, and not in Brooklyn. On May 7, 2006, WWE.com announced that, as part of Jakks Pacific's WWE Classic Superstars collection, they would be releasing a Brooklyn Brawler action figure. At Vengeance, Brawler appeared as Doink the Clown when he came out to the ring with Eugene during Eugene's match with Umaga. On August 1, 2006, Lombardi went to the ECW brand for a match against then ECW wrestler, Kurt Angle. Lombardi quickly lost when Angle applied an ankle lock on him. That same week, he appeared on SmackDown! against Vito, losing by submission. On the December 18 edition of Raw, Lombardi appeared in the 30 Man Battle Royal as the Brooklyn Brawler. He reprised his role as Kim Chee, having apparently reconciled with Kamala, on the August 11, 2005 edition of RAW accompanying the Ugandan Giant to the ring for his match with Randy Orton. He would also appear with him on the June 26, 2006 episode for Kamala’s match against Umaga. On the 15th anniversary of Raw on December 10, 2007, Lombardi appeared as Abe "Knuckleball" Schwartz in a segment. When Triple H saw him, he exclaimed "I guess the Brooklyn Brawler was busy tonight". Lombardi made a return appearance in the November 15, 2010 "Raw Goes Old School" episode of Raw as the Brooklyn Brawler with Harvey Wippleman as his manager. He lost in a match against Ezekiel Jackson. The Brooklyn Brawler made a surprise return to pay-per-view on December 16, 2012 at the TLC pay-per-view (which took place in Brooklyn), teaming with The Miz and Alberto Del Rio to defeat 3MB (Heath Slater, Drew McIntyre and Jinder Mahal). Brawler won the match for his team via submission with a Boston crab on Mahal. At the July 15, 2013 Raw taping from Brooklyn, in a match taped for Superstars, Brawler was defeated by Ryback.